Michael Lichstein will be remembered as one of the most outstanding amateur bowlers ever from the State of Connecticut. His notoriety began during his High School days at SHS, and his accomplishments over the last 30 years are impressive to say the least. Mike was the high roller and champion at a Las Vegas ESPN tournament in 1988, and high roller and runner-up in another ESPN televised competition in Atlantic City in 1987 along with a 4th place finish in a tournament in Texas. He won 23 titles on the Junior Bowler Tour, and he won 6 national American Bowling Congress (now called United States Bowling Congress) championships. 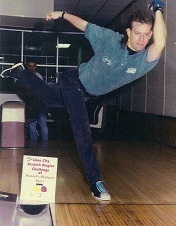 Locally, Mike has won 27 New England Bowling Association titles, and was the NEBA Bowler of the year 5 times from 1988 to 2004. In Connecticut and Massachusetts tournaments he was Bowler of the year in 2001 and 2003 and has won 39 events. Along the way, Mike has rolled 37 sanctioned 300 games and 23 sanctioned 800 series.